If you are a parent, then God has commanded you to teach your children about Him. And He has commanded you to teach your children to worship him expressively. In Psalm 78:4, the songwriter, Asaph, declares: “We will… tell the coming generation the glorious deeds of the LORD, and his might, and the wonders that he has done.” Asaph is an example of both a father who led his children in worship and a leader who led the community in worship. Asaph wrote worship songs that gave praise to the Lord and reminded the people about all that he did. This is God’s command for us. One generation declares the works of the Lord to another generation. What do we declare? Look at the passages. We declare God’s mighty acts, his splendor, his majesty, his power, his glorious deeds and wonderful works, his abundant goodness and his righteousness. Slow down and say thanks to God for what he’s given you. David says, “I will meditate on your wonderful works.” One of God’s wonderful works is your children. Your son or daughter is fearfully and wonderfully made. So, the next time they make you laugh or say something cute and you’re tempted to pull out your phone and share that moment with the world… Instead, just take it in. Enjoy it. And remember the Creator who gave you this gift. Stop and say thanks. Put off complaining and put on a life of praise. Kids will wear you out! When they’re babies, it’s those midnight feedings and constant diaper changes. As they grow, you’re running here and there to practice or clubs. Helping a child grow up is hard. And you know what we do? We get with our friends or online and complain about it. We’re complaining when—according to these passages—we should be telling, proclaiming, celebrating, and joyfully singing about God’s goodness and love. So, when you’re tempted to complain, stop and remember that God loves you. Then, celebrate him. Check out the new kids album from Sojourn Music, Clap Your Hands, Stomp Your Feet. Put that music on and sing about God as you drive in the car with your kids. Read a Bible storybook before bedtime, and pray a little prayer of thanks as you tuck your baby in at night. Most of all, enjoy yourself as you're celebrating God! Expressive joy in Christ makes his message believable for our children. You are the curriculum that your child will learn most fully. So, be expressive. It is a good thing to praise the Lord (Ps.92:1). Encourage your kids to be responsive and expressive! You shouldn’t demand outward expression from your kids, but you can encourage it. The Scriptures call everyone to clap their hands to the Lord. It's a universal appeal (Ps. 47:1). So, we should be clear with our children that God is calling them to respond to him as well. Invite your kids to respond to God with their bodies, and explain why we worship the way we do (Ex. 13:8). You have the privilege and responsibility to show your kids the greatness, power, and glory of Jesus. So, take time to talk about the words we sing on Sunday. Take time to ask questions about what a song means and how its words apply to your child’s life. By asking, you can discover how much your kids understand about what we’re doing. (1) Explain to your children why we sometimes raise our hands when we sing or pray. Read 1 Timothy 2:8. Then, explain how we want our kids to get comfortable lifting their hands in worship, but we don’t want them to misunderstand what it signifies. We don’t lift our hands in order to become holy. Rather, we lift our hands as an expression of what God is doing in us. Lifting our hands shows that God is holy (different from us), and he has made us holy (different from the world). 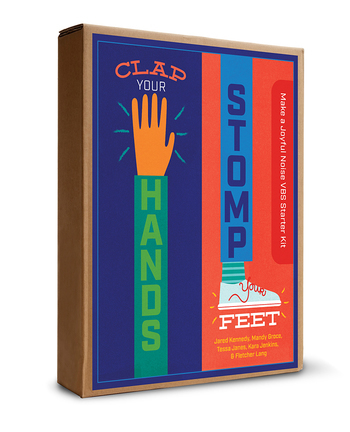 Check out the new Clap Your Hands, Stomp Your Feet VBS. This worship themed VBS includes a director’s guide, games guide, craft and assembly guide, printables, and much more. It even includes a studio-recorded children’s worship CD and digital songbook produced by Sojourn Music. Purchase now from New Growth Press.